These days there are THOUSANDS of gluten free, weight loss and diet advice on the Internet but MANY of them are NOT scientifically based, provide INACCURATE information and can even HARM your overall health! No wonder a lot of people FAIL at making small permanent healthy changes…I know I have. Now let me tell you, I am NOT a fitness model nor I have amazing genes (e.g. people who eat anything and always look amazing cause of their magic metabolism). I am NORMAL. So if I’m very naughty naturally I gain weight. Is Gluten is SABOTAGING Your Health & Your Pockets? I’ve struggled with MY unhealthy gluten symptoms for years before I finally got diagnosed. 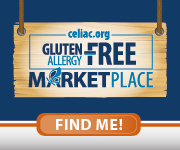 Celiac Awareness Month – Spread the Word! The NFCA – National Foundation for Celiac Awareness is spreading the word to increase diagnosis in family members with genetic risk for Celiac Disease. Let’s help getting the word o ut there! Have a serious talk with your family and educate them about their genetic risk and the importance of getting tested for Celiac Disease. Anyone can start a gluten free diet but not everyone will have the benefits that come from a balanced lifestyle. Today I want to share with you my best kept secrets to live naturally gluten free and achieve permanent results.